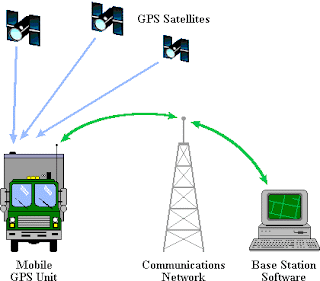 The Global Positioning System (GPS) consists of more than 30 satellites in constant orbit around the world. At any given time a number of GPS satellites are in a line of sight from any place on earth. A GPS receiver listens to signals from these satellites and uses the distance to multiple satellites (known as triangulation) to locate its position with high accuracy. GPS has an accuracy of a few meters under good conditions. GPS works best in open environments as the signals from the GPS satellites are quite weak and fade when the line of sight is obscured by obstacles such as buildings. To track your vehicles you need to install a GPS tracking device with an Internet connection in each vehicle. The tracking devices will send real time position updates to a server. Locating the vehicle: A GPS tracking device is installed in each vehicle you want to track. There are many options with small portable GPS devices, vehicle mounted GPS devices and software clients for vehicles that are equipped with laptops or PDA:s.
Sending position updates to a Server: The position information received by the GPS device is sent to a secure server in real time. This is usually done over a GPRS or using SMS in a mobile communication network. You can also use a satellite communication link in areas with poor mobile network coverage. Using the positions: Vehicle positions and vehicle status information sent to the server are shown in real time in a web browser. You can also send alerts over email and SMS for examples when a vehicle is speeding, fuel is stolen, a vehicle leaves or enters an area, and so on. Reports are also available to show vehicle usage, alert history, etc.